The superb exhibition Vermeer and the Masters of Genre Painting currently nearing the end of its run at the National Gallery of Ireland, ask and adreeses sucessfully fascinating questions about how the genre artists of the Dutch Golden Age influenced each other and spurred each other on to ever great feats of virtuosity. It has not addressed another, on going questions people always discuss in relation to Vermeer, that eternal one, did Vermeer use optical equipment in his Art? 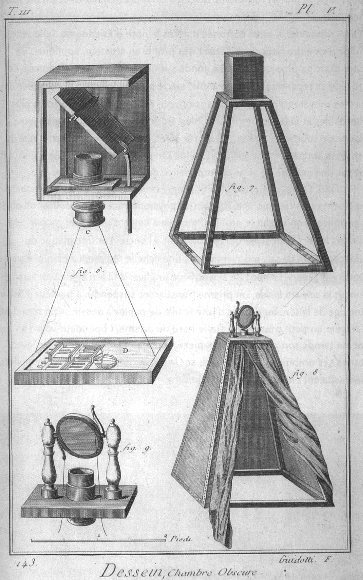 Did he use, for example, a Camera Obscura to project an image from a bright room into a dark one? In a process like this, the image passes from a brightly-lit room, through a tiny “pin hole” aperture in a wall or partition passing into a darker room, thereby being effectively projected onto a blank wall or a canvas in the dark room, where of course an artist can trace the outlines, and transfer such an image perfectly. It has long been claimed by many people that Vermeer may have used such devices and techniques. There are several reasons for this claim. One is Vermeer’s incredible, “photo-realistic” attention to detail. His works are often like looking at a photograph. That’s despite Vermeer having had no known formal training (that we are aware of) and despite the odd fact there’s almost no evidence Vermeer made preparatory sketches for his paintings. Secondly, some people claim to detect further evidence in the shape and spaces apparent in his interior views. Professor Philip Steadman’s book Vermeer’s Camera: Uncovering the Truth behind the Masterpieces I’m told notes that many of Vermeer’s paintings certainly appear to have been painted in the same room. Steadman even found six of the paintings are the right size if they had been painted from inside a camera obscura in the room’s back wall. One presumes the professor means Lady standing at a Virginal; Woman with a Lute; Woman with a Water Pitcher; Woman in Blue Reading a Letter; Woman with a Pearl Necklace; Woman Holding a Balance; all of which have remarkably similar compositions. a mid-sized figure, seen from a pint between the knees and ankles, lit by a window to the left of frame. The Milkmaid (c 1654) is not much different, and was very possibly painted in the same room. Finally, some people claim to detect additional evidence in the thick, globular highlights Vermeer painted, those “pearly highlights” which they argue are the result of the primitive lens of a camera obscura producing “halation” -a sort of lens-“flaring” which will be familiar to photographers. Both the books Secret Knowledge by renowned British artist David Hockney and Vermeer’s Camera by British architecture professor Philip Steadman, have theorized that Vermeer potentially used a Camera Obscura to “guide his painting”. And “guide” is the correct word here by the way. Such techniques will help you transfer a simple outline, but it will not paint the picture for you. You still need the incredible skill to depict the play of light on colour, and across endless different surfaces and materials, each material (grape, fur, silver, glass or skin) with its own unique texture, each requiring a different, unique painterly solution. No outline projection on a wall is going to assist an artist with the painting part of the job. All it may help do is to help transfer an outline of shapes onto a canvas. Nonetheless, that’s an important piece of help. Only people who’ve tried to record large amounts of complex shapes, and locate them convincingly in space know just how difficult and time-consuming it is. And yet the accuracy, the sheer verisimilitude of Art from the Dutch Golden Age can be staggering. Indeed from some Italian artist in the same period too. Think of Canaletto for example, and his extraordinary canal views of Venice. His vedute (as such works were known). Each is packed with vast quantities of highly precise, immensely detailed visual information, all perfectly rendered. How the hell did they all do it? I spent hours once looking at a view of Piazza Navrona in Rome, painted by the brilliant 17th century Italian vedute artist Giovanni Paolo Panini. Here it is. Panini was roughly a contemporary of Canaletto, another painter of those Vedute pictures so prized by wealthy English, Scots and and Irish aristocrats on their Grand Tour. The National Gallery of Ireland version of his View of the Piazza Navona is one of two pictures Panini painted of the piazza. It’s a space I knew quite well, having lived near to it in Rome years ago and having tried to draw it often. It’s an unusual space, not a square at all, but rather very long and thin. So thin in fact relative to its length, that it’s simply not possible to stand back or to take in this view at once. One is never this far back. I concluded therefore not only was it not possible to for Panini to have painted the image unassisted; it was impossible even for him to have seen it, not as one coherent view. You simply can’t stand back far enough to see the piazza all at once. In other words, this view is impossible. You would be have to be looking through other buildings. (These buildings in fact are roughly where the first line of people are standing in his picture) In reality there are buildings there, so it’s not possible to observe the piazza all at once like this. What too about the other issue; the sheer mass of complex detail? Up close with this Panini work, you see thousands of faces, doors, tiles, windows and window frames, often with people inside. You can even see the details of their clothes. Again and again with some 17th century works (and with some earlier ones) the more you look, the more you’re tempted to ask, how on earth was it done? In the last 10 years an amazing book by the British artist David Hockney provided at least part of the answer to that question. His interest piqued, by the near-impossibility of the challenges many historical artists took on, Hockney investigated the visual and optical aids available to them from the 16th century on, such as camera lucida; camera obscura, and mirror-lens projections. Hockney then conducted his own experiments. Mostly in the form of drawings using and assisted by those technologies which were available to historic painters at the time. There’s plenty of evidence in Hockney’s book. Certain patterns occur. Once you know how these devices worked and how they were used, including both their advantages and their limitations, it’s often possible to discern their use by informed observation of the paintings themselves. His conclusions are more than convincing. They seem irrefutable. Hockney’s wonderful book is in my opinion, the most original input to our understanding of old master paintings of the last 50 years. Yet remarkably, when it should be on the reading list of every student of art history, it’s often out of print. This seems bizarre. The book provoked quite a lot of criticism, even hostility. It has has fallen victim, one suspects, to a misunderstanding of its message, namely that using optical devices somehow diminish the skill or achievement of the artist. That is a misunderstanding. They do nothing of the sort. Such techniques and devices only assist the artists in observing scenery, city-scapes or still lives. They do nothing to help make the marks, brushwork, handling of fluid material or other virtuosity that record that information, the fluid stunning touches of paint and brilliantly balanced light and dark and colour that make these paintings so beautiful. Only the artist can do that. Thank you for reading. If you liked the article – or indeed violently disagreed with it, please leave a comment. Readers and art-lovers who are either resident in Dublin, or who are visiting in October may be interested in the little Art symbol reading workshop I am leading at the National Gallery, from 5.55pm to 8.10pm, on the evening of Thursday 26th October (2017) Tickets and details may be found here. Fascinating. I totally agree with you and David Hockney, using an optical device in no way diminishes the unbelievable technical skill of the painting in these masterpieces. Thanks Julie. Really glad you enjoyed it. Many thanks for taking the time to comment. Thank you Arran for a really interesting post. Fascinating revelation about Panini’s ‘View of the Piazza Navona’. With regard to the use of tools and optical aids used by classical painters, I remembered ( and looked it up again) an observation made by Leon Battista Alberti (1404 – 1472) in his book “On Painting” : “Nor will I hear what some may say, that the painter should not use these things (aids in painting) …I do not believe that infinite pains should be demanded of the painter, but paintings which appear in in good relief and a good likeness of the subject should be expected. This I do not believe can ever be done without the use of the veil.” The “veil” is the grid we all know about and use to this day. Albrecht Durer was very innovative in the use of mechanical aids . I can imagine that a modern day equivalent of Durer would delight in the technology available to the artist. Thanks again for the wonderful post. Thank you very much Dermot for such a kind response. And for such an interesting reference. That’s fascinating Alberti said that, about optical aids. And I entirely agree with you: – I’ve absolutely no doubt whatsoever the greatest artist of the past would have positively seized on today’s technology! Seized it, then they would have done amazing things with it. Because ultimately its aesthetic judgment, intellect and intellectual curiosity that sets the great artists apart. Not whatever toolkit they happen to employ. Thanks again very much for your support. -Arran. My pleasure Hilda! Yes, Vermeer is just endlessly fascinating. Such a superb, but also such an enigmatic artist. Many thanks for your kind message, and for all your support. -Arran. Next Post Hugh Lane to Broadstone & Grangegorman walk, 11.30am Sat 21st Oct.